Following several recent columns on Furze Croft, St. Margaret’s and the Sussex Masonic Centre – some of Brighton & Hove’s finest 1920s and 30s Art Deco gems – I set off to Brussels to find more examples in Europe’s capital. After just a little research, a piece on Art Nouveau seemed far more appropriate. My last trip to Brussels was all about the usual tourist sites. This time, I set out to visit a very specific set of buildings. Victor Horta (1861-1947) was a Belgian architect and designer. 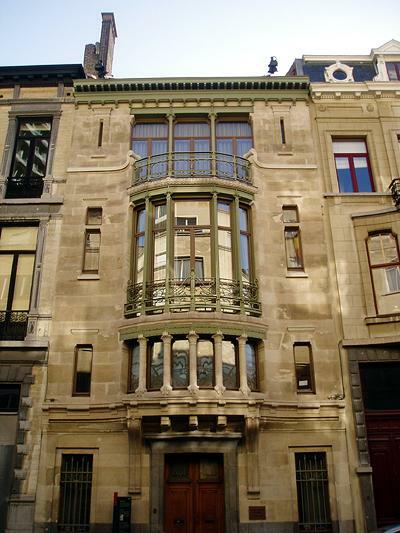 The Hôtel Tassel is a townhouse at 6 Rue Paul-Emile Jansonstraat, which was built by Horta in 1893-4 for Emile Tassel, the Belgian scientist. Although it was not Horta’s first townhouse, it is considered to be the first ever Art Nouveau building due to its layout, materials and decoration. Everything in and on the house was made to Horta’s own designs including the stained glass windows, mosaic floors and electrical fittings. 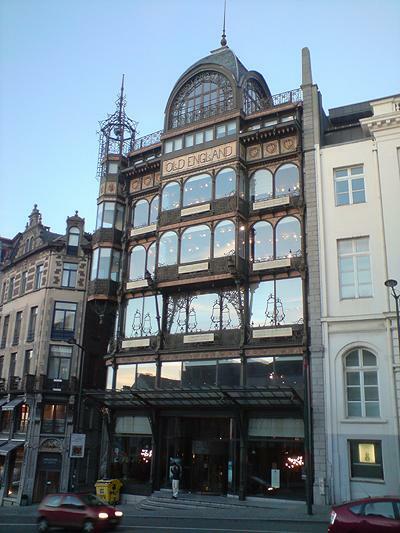 The Hôtel Tassel is certainly the most historically important Art Nouveau building in Brussels. Along with three of Horta’s other buildings, it was put on the UNESCO World Heritage List in 2000. To put that into context, in the south-east of England, (not including London), only three sites (all in Canterbury) have been given that same recognition. Despite this, another building altogether, the Old England Building, which houses Le Musée des Instruments de Musique, is possibly the most charming. Its exterior is simultaneously organic and industrial – both alive and machined. It is one of the most original buildings that I’ve ever seen. Art Nouveau arose from the Arts & Crafts Movement and for examples in the UK, I would recommend the splendid buildings of Charles Rennie Mackintosh in Glasgow. There are many other examples across the continent – many of the best are in France – but I’m particularly fond of the work of Antoni Gaudi in Barcelona. Like Art Deco, Art Nouveau is a difficult style to define. It crosses many disciplines including even jewelry, textiles and household utensils. It is characterised by a natural theme, often floral, with a respectful nod towards technology. Nothing’s likely to match my trip to New York in 2006 when I visited some of the world’s most famous Art Deco buildings including the Empire State Building, the Chrysler Building and the Rockefeller Centre. However, Brussels is certainly the place to go for Art Nouveau.